Tuber helped the Public Service Division, which is under the Prime Minister’s Office, to rebrand Challenge from a lacklustre newsletter to a magazine that public officers look forward to. We have produced Challenge since 2010, seeing it through several redesigns for print and the web. More recently, as part of the Public Service’s digital transformation, Tuber is ramping up its efforts, increasing the magazine’s online presence through web-optimised content, email bulletins and digital marketing. At the same time, we stay committed to maintaining high editorial standards for the print edition of the magazine, along with its digital pair. We introduced a new tagline – “Approaching the Public Service Differently” – as a reminder for the client to keep pushing the envelope and to always ask bold questions on behalf of its readers. In the 2017 print redesign, we created a dynamic new masthead. Taking cues from the slant of the previous Challenge masthead, the current masthead has two ‘L’s in the shape of obliques. They signify: 1) the title going digital, mirroring the two slash strokes in a URL and 2) a visual anchor, with the two ‘L’s incorporated into the design theme of each issue. We brainstorm ideas, spot and research trends, highlight personalities for profile interviews, and pitch stories that appeal to Challenge’s wide range of readers, which include senior leaders and parliamentarians. For a cover story on racism in Singapore, we aimed to portray the touchy issue in a visually arresting and less predictable way. We started off with an idea to use the Pantone colour chart to show different shades of skin colours. After further brainstorming, we went local by using Singapore’s unique beverages to represent different races. The eye-grabbing result earned praises from readers and was recognised in the 2018 Content Marketing Awards as a finalist for Best Cover in the Print category. We used the concept of an old toy-dispensing vending machine to match the theme of remembering the past. Tuber sourced for a gashapon (capsule vending) machine along with items reminiscent of Singaporean childhood, such as toy soldiers, five stones, country flag erasers and miniatures of old furniture and playgrounds. For the cover, these items were carefully placed inside real plastic capsules, before being photographed through the plastic container of the gashapon machine. Readers flipping from the cover to the pages of the story will find these childhood toys, games and snacks unfurled and broken out of the capsules. Taking inspiration from reading widely and pop culture, we surprise and enthrall readers visually so that stories are read and shared online. We’ve styled public officers to look like Borat, characters in the movie Trainspotting and secret agents. To get the desired results, we edited photos of subjects to make them look like they are floating in the air, and under glass jars. These two profiles are presented in the subjects’ voices, with edits only for length and clarity. 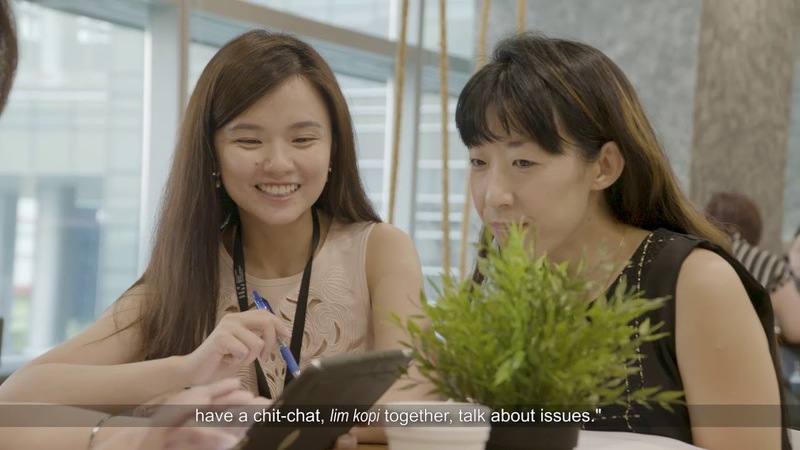 Tuber did a face-to-face interview with Agnes to find out how her stint at design thinking consultancy IDEO led to her work at the Land Transport Authority. She was tasked to use her design expertise to improve commuters’ experience. For the visual concept of the story, Tuber took inspiration from the poster of the popular 1996 movie Trainspotting. To bring out her feisty personality, Agnes was styled like a character from the movie, yelling and posturing. The title riffed off the film’s to highlight Agnes’ transformational work at the LTA. The article was widely shared, drawing attention to her unusual approach to solving problems. For the online version of this article, Tuber incorporated positive feedback into the artwork, in the style of film reviewers’ quotes on movie posters. From research and insider information, we knew that Gene enjoys fashion and uses the hashtag #fashionlibrarian. We wanted to show how his personal interests in fashion and film fed into his work as a public officer, including his work at the National Library Board. We did not hold back from asking how his being different may have affected him at work. His handwritten replies were transcribed, edited and incorporated into the final piece. Reflecting the quirky mix of his interests, work and personality, Tuber designed a futuristic library scene. For the photoshoot, the books and Gene were shot separately, before being stitched together digitally against a backdrop of library@Orchard. We worked with our web partner Digital Boomerang to rethink the section names and SEO strategy for the magazine. We introduced videos for Cuppa interviews and behind-the-scenes shots of stories, so that readers can get a glimpse into the ins and outs of photo shoots. The client wanted to have an internal e-newsletter covering public sector transformation. Tuber came up with the name, playing on the letters PST, and designed the masthead. The e-bulletin delivers bite-sized snippets of innovation and organisational transformation efforts by individual officers and agencies across the Public Service. Challenge’s new website was launched in March 2018. With sustained online marketing, page views and shares have steadily increased, despite the fact that public servants’ work computers are delinked from the Internet. This means that public officers are engaged by Challenge and reading it on their mobile phones. They also participate actively in contests. Print copies are delivered to public officers’ workplaces, and can be found at public spaces in government buildings, schools and public clinics and hospitals. We have also produced collaterals carrying the Challenge brand and tagline, like tote bags, pouches and post-it notes. Many public officers continue to proudly use them today. Keen to find out more or work with us?